Lockheed Martin’s Reusable Booster System Flight Demonstrator Program is under way, designed to advance the affordability, operability and responsiveness of future spacelift capabilities over current expendable launchers. This image shows how the vehicle would land. Billed as the nation’s first dedicated commercial spaceport, New Mexico's Spaceport America is becoming a desirable location to experiment with new types of reusable booster systems. Armadillo Aerospace, of Heath, Texas, used the site on Dec. 4 to test their STIG A reusable suborbital rocket technology. The rocket shot to a projected suborbital altitude of 137,500 feet (about 42 kilometers) above the Earth. The STIG A flight demonstrated a number of technologies that Armadillo is assessing for a human-passenger suborbital program, said Neil Milburn, vice president of program management at Armadillo Aerospace. View of Earth above Spaceport America from Armadillo Aerospace's STIG A rocket flight at apogee (highest point) on Dec. 4, 2011. The flight of STIG A was an important event in many respects for Armadillo Aerospace, Milburn said. "It met an important altitude milestone for our partners Space Adventures, it was the first time that an Armadillo vehicle went supersonic, it qualified the STIG family of vehicles for the NASA Flight Opportunities Program, and it exercised many of the technologies that we need for our manned suborbital program," Milburn told SPACE.com. Armadillo Aerospace is already back home and working on STIG B, the space capable version of the STIG family of vehicles, Milburn added, "and the goal is to be back at Spaceport America early in the spring of 2012." The STIG A test flight was done as a private, unpublicized event at the request of Armadillo Aerospace, since the company is testing proprietary advanced launch technologies. The STIG A rocket built by Armadillo Aerospace roars skyward from New Mexico’s Spaceport America on Dec. 4, 2011. According to a statement from the New Mexico Spaceport Authority, the STIG A toted skyward a scientific payload that was designed, built, tested, integrated and performed by a team of undergraduate students at the School of Aeronautics and Astronautics in the College of Engineering at Purdue University in West Lafayette, Ind. Purdue’s experiment studied how the flow of liquids and gas is affected by the gravity and acceleration levels encountered during spaceflight. The Armadillo Aerospace launch was the group’s third flight from Spaceport America, marking the 13th vertical launch test from Spaceport America’s Vertical Launch Complex since 2006. "I am so happy that Armadillo’s test flight at Spaceport America was such a success," said Christine Anderson, executive director of the New Mexico Space Authority. "They have been working diligently on their space vehicle and the successful flight is a testament to all their hard work. We are very pleased to have them as a valued tenant and look forward to many more Armadillo successes." In a related Spaceport America development, Lockheed Martin announced Dec. 5 that the company has been selected by the U.S. Air Force to develop a program to test reusable booster systems and ground experiments. For the so-called Reusable Booster System program, Lockheed Martin has also entered into an agreement with the New Mexico Spaceport Authority to conduct flight test operations from the space terminal. The work is being done for the Air Force Research and the Air Force Space and Missile Systems Center. The initial reusable booster effort is valued a $2 million, with up to $250 million in contracts projected over a five-year period. Seattle-based Andrews Space and Boeing, as well as Lockheed Martin, also won RBS money from the Air Force in a competition to build a pathfinder vehicle. 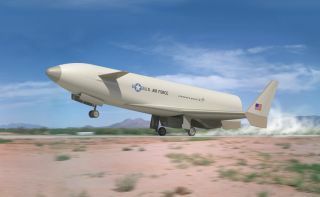 While specific details of the Lockheed Martin RBS concept are under wraps, Slater Voorhees, Lockheed Martin RBS program manager, told SPACE.com: "It is a decently sized vehicle to get up to flight altitudes and flight mach numbers that the Air Force wants to look at." Voorhees said the company's liquid-engine-powered pathfinder is a vertically launched, horizontal landing craft. This demonstration vehicle would showcase quick turnaround and shakeout boost-back landing site technologies, he said. According to a Lockheed Martin statement, an initial flight of the RBS vehicle is scheduled for 2015. As viewed by the Air Force, the Reusable Booster System is seen as a next- generation launch vehicle that will be more affordable, flexible and responsive than the currently available lineup of expendable launchers. Lockheed Martin's proposal for a Reusable Booster System would glean data from this pathfinder vehicle — a vertical launch, horizontal landing craft. This illustration shows how the vehicle could launch from a ground station. Lockheed Martin’s prototype autonomous rocket plane roars down launch rail in a 2008 test flight from Spaceport America in New Mexico. Since 2007, engineers within the Advanced Programs division at Lockheed Martin Space Systems Co., in Littleton, Colo., have flown a reusable rocket plane that makes use of launch services provided at Spaceport America by UP Aerospace of Denver. The small, unpiloted winged vehicle, dubbed "Revolver," has been used as a demonstration and data-gathering experiment. Some accounts of the craft pegged it at weighing 200 pounds (91 kilograms) and is about 8 feet (2.4 meters) long, with a wingspan of about 6 feet (1.8 m). NMSA's Anderson said that the new Reusable Booster System work "is a very promising technology and very much needed in the launch industry," and was pleased that Spaceport America is part of the Lockheed team. "We look forward to supporting this program as it moves forward," Anderson said. Leonard David has been reporting on the space industry for more than five decades. He is a winner of this year's National Space Club Press Award and a past editor-in-chief of the National Space Society's Ad Astra and Space World magazines. He has written for SPACE.com since 1999.